Get Ready for Fall…the season to follow! A Path to Follow, but to where? This is a path made from oyster shells, so appropriate for those living on or near the water. The material is also a good use of resources available…ultimate recycling! If you don’t live near oysters…substitute pea gravel or decomposed granite, or stones…anything hard surface and easy to walk on. Rosemary as an edge here is especially nice. A path to follow is something I always include in any landscape design. 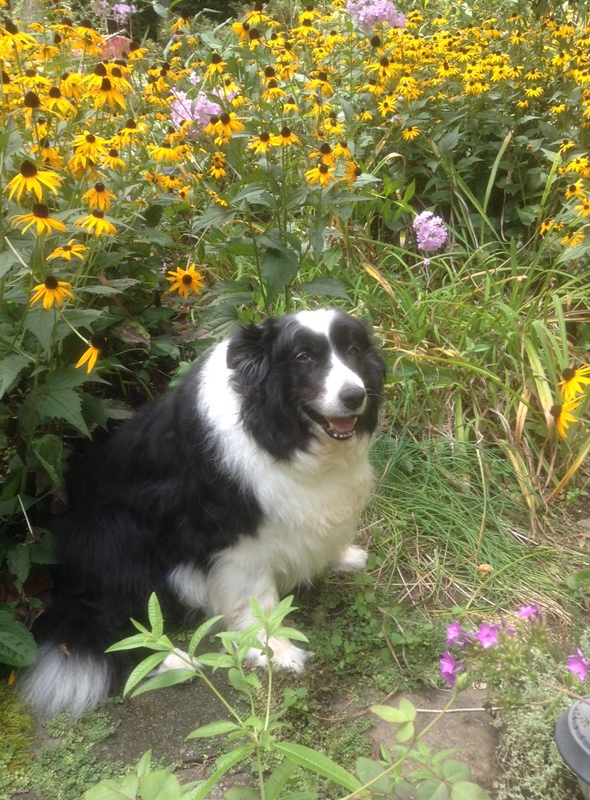 It is a “vehicle” for leading/guiding one about the garden…for strolling or getting to a place such as a potager or tool shed, or just a quiet spot to sit and relax for a bit. It is also a perfect way to enjoy fragrant herbs and roses planted along the pathway edge while strolling through the garden. I really like the path shown and where it follows and then moves on again…in the center of a potager with herbs and rose quadrants, adding interest and texture and a change of surface to the garden. 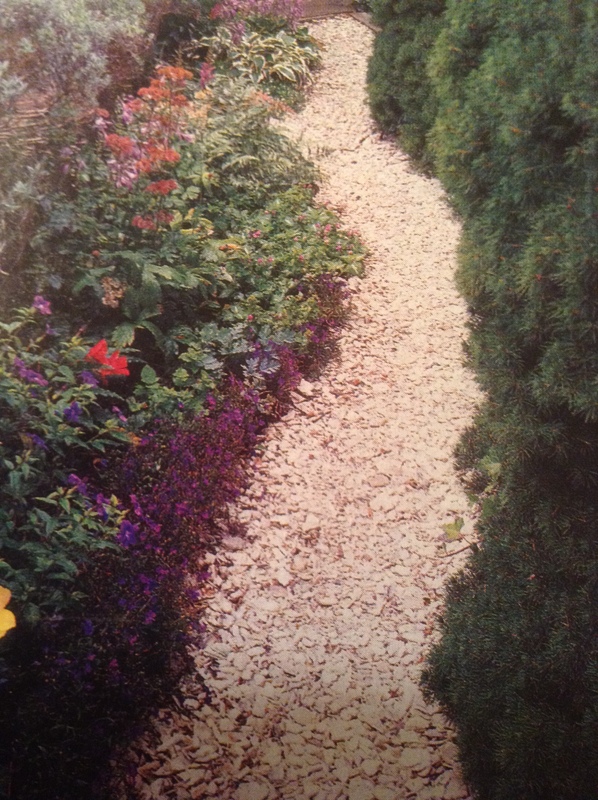 You’ll notice three different path materials…large stones lead to the gravel which ends with the round river rocks. Of course, a nice flat surface is helpful here! In Texas, in my dear friend’s yard, this door beckons one to continue along the path through a field of wildflowers…the key to the locked door rests on a hook above the door frame. In this field, wildflower seeds were tossed out in late fall…the next spring the whole acre was full of bluebonnets and red clover and vast splashes of yellow and red flowers. 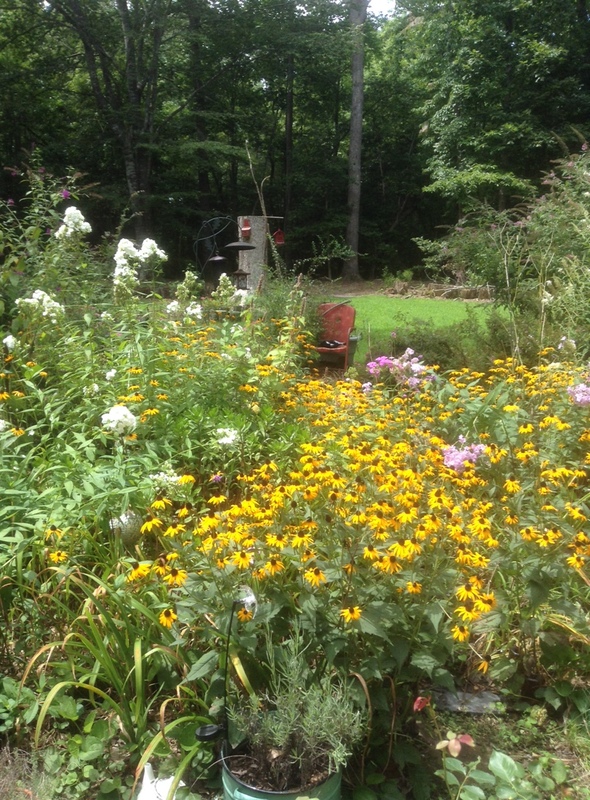 Every season the blooms dropped their seed heads and the field of flowers grew thicker and even more colorful with every spring to summer to fall! The colors changed with the seasons. Soon it will be the time of richly colored leaves, bright berries, ripe nuts, and acorns…the hot summer weather will eventually yield to a cooler period with leaves falling from deciduous trees. This leaf fall usually coincides with the beginning of shorter daylight hours and the first few chilly mornings. One of the great benefits of fall, aside from the beauty of colors and change of weather…it is truly the best season of the year for planting trees and shrubs. Good soaking rains, still warm soil and cooler daytime temps provide an environment encouraging plants to quickly make new roots before cold weather sets in…roots that will be better able to support growth when leaf buds burst open in the spring. Trees and shrubs planted in fall have a much better survival chance if you follow the simple steps of soaking, teasing roots, back-filling with native soil, watering properly and mulching…PLEASE, keep mulch away from trunks and stems! In the flower garden,the unmistakable, and usually reliable signal for the beginning of fall is the appearance of hardy fall asters and late-blooming Montauck daisies. Fall gardens brim over with brilliant yellows, cool blues and glowing reds and some of the most perfectly formed roses of the year…often followed by great rose hips. For a rich indigo blue, nothing beats hardy blue plumbago, a favorite plant for along the edge of a border or path.The foliage takes on scarlet and maroon tones in cool weather while the plant is still in glorious BLUE bloom. Another favorite is the simple, refined beauty of Japanese anemones…one of the loveliest plants of the LATE garden season. These hardy perennials tend to wander about the garden at will, occupying any moist spots in partial shade…as if Mother Nature saved them up for a late surprise. Flowering for several weeks into late fall…these simple pink or white blooms are lovely combined with Autumn Ferns. During this time of late summer is when I begin to make the sugar water mixture much stronger for the little hummers, 2 cups sugar to 4 cups water…Soon it will be time for them to start the long flight to Central America for the winter season. SO, it makes sense to make their nutrient source a bit richer …there will be no food in-flight until the next stop-over!! Planting a Fruit Tree NOW…Apples are easy to grow and manage. Choose varieties carefully for the area in which you live. Blossoms need to be pollinated by bees in order for apples to form. Some apple trees are now considered “self-pollinating” but others will definitely benefit from cross-pollination with another variety. Remember how important it is to plant early blooming flowers and herbs nearby as companions to attract bees and beneficial insects to your “orchard”…Think about all the good things you can make with apples…from sweet to savory…and they help keep the doctor away! So who needs QUICHE…? I LOVE QUICHE…so easy to make, delightful as a meal with a simple salad and Voila’ !! Try this recipe for a different taste on quiche…a Double-Crust Leek and Bacon Pie!! it’s also good leftover for lunch…cold. Mix 10 oz. of soft cream cheese with 2 beaten eggs, fold in the potatoes and leeks then add the bacon. Prepare the pan…I use a 9×9 pan or 8×10 glass dish, size depends on your filling. Put one section of purchased puff pastry, rolled a bit thinner, on bottom of baking dish, pile the filling into the crust…roll out remaining pastry section and place on top of pie mixture to make a top crust. Fold over and crimp the edges to seal. A Lavender Treat to keep in the tin…Lavender Cookies are the tasty best with lemonade or tea in the afternoon…To make: Cream 1/2 cup soft REAL butter and 1 cup sugar until light and fluffy. Beat in 2 eggs, 1/2 tsp. REAL vanilla and 2 Tblsp. chopped organic lavender buds, your own, of course! Mix well and then combine: 1 1/2 cups flour and 2 tsp baking powder…add to butter mixture and stir til well-blended. Drop by spoonfuls on ungreased baking sheet with parchment paper. Bake at 375 degrees for 8-10 minutes or until just barely browned enough around the edges…the cookie should be soft. Cool and enjoy! From a very relaxed Holly and Patricia…it’s the lavender!! or, Eat well, laugh often, love a lot!! Summer is Served…with scents of purpose and glory! RELAX and ENJOY…There soon comes that one lovely late summer day when fragrant flowers on the windowsill say so much…this is usually the lazy season…after all the hectic nurturing and mulching and weeding earlier in the season, it’s time that most gardens tend to look after themselves, well, kinda…and gardeners tend to relax a bit and enjoy the bounty! Except, of course, for the watering that always needs to be done when Mother Nature fails to provide the necessary one inch of rainfall per week! All set for summer inspiration…I can smell the lavender, the tall pink phlox, and the roses…I can hear the birds, the bees, and the crunch of gravel as I walk along the path…and I can taste the berries and tomatoes warm and fresh from the vine. What better way to celebrate the pleasures of the season at the end of a meal than with a glass of something fresh and lively…LIMONCELLO! Smooth and sweet, intensely lemony…So astoundingly easy! This is a rather loose recipe so you may need to experiment with sugar amounts a few times to find your best flavor. First, using a vegetable peeler, remove the peels from all the lemons, being careful not to get too much pith [the white part]. Put the peels in a one quart jar and cover with the whole bottle of vodka. Put the jar in a place out of direct sunlight and let it sit for at least a week. The longer it infuses, the more lemony your limoncello. Next, strain the vodka through cheesecloth or a brown coffee filter. Now you can prepare the sugar syrup: Bring the water to a simmer and stir in the sugar. Allow to cool. I start with one cup water to one cup sugar, you can always make more as you taste and then add the syrup to the limoncello. More water will dilute the alcohol base, more sugar will obviously make it sweeter. FINALLY, pour the sugar syrup into the infused vodka… after you are happy with the taste…Pour mixture into a clean bottle or bottles. Chill the limoncello in the fridge and then for long term,store in the freezer…which is the best way to keep it fresh. Something All Sweetness and Light to enjoy with a glass of Limoncello…A thick slice of Victoria Sponge is the perfect dessert treat to end an afternoon meal in the garden. Many variations on a recipe have been around for years, actually since the Queen lent it her name. There were even contests every summer throughout villages in England to determine who could bake the best “Sponge”. The English SPONGE is very much like our old-fashioned pound cake. One taste of this buttery rich cake and you’re immediately transported back to the days of grandmother’s kitchen…but creating the cake is simpler and takes much less time. I often make this small cake and freeze half…the other half I cut into squares to give me just a bite to enjoy with my cup of late evening herb tea. Okay, well sometimes I do eat a whole slice!! You can play with flavors…I added organic chocolate cocoa once and found the results deliciously just sweet enough; fresh lemon juice and grated peel is also nice. RECIPE: Cream together: 3 sticks unsalted butter and 1 3/4 cups sugar until light and creamy. Usually about 5 minutes. Add 6 large organic eggs, ONE at a time, beating in well after each. Being patient and mixing well will prevent curdling. Stir in 2 tsp. pure vanilla. Sift 2 2/3 cups flour, 1 1/2 tsp baking powder and a scant 1 tsp salt into a separate bowl…fold into the wet ingredients by hand. Be gentle and stop mixing when flour is incorporated…careful, do not over mix. I usually add a few tablespoons of milk or cream to make the mixture drop off the mixing spoon like thick cream. Time to preheat the oven to 350 degrees. Divide mixture between two 8 inch cake pans that have been lightly greased with butter, and dusted with flour. A piece of parchment paper lining the bottom of the pan is helpful. Bake for 35-40 minutes…till set. Allow cakes to cool for at least 5 minutes in the pan before removing to wire rack for further cooling. As shown in the photo, some bakers like to spread jam, preserves and cream between two layers to serve. I prefer a single layer, plain…or sometimes with fresh strawberries. Try it and see what you prefer. A sun-ripened tomato is one of the great pleasures of summer…I grew up with just picked tomatoes, huge, bursting with juicy flavor, and warm from the garden. It was LOVE at first taste. There were no dozens of varieties as we see now…just luscious sweet slices waiting for a bit of cracked pepper, and some mayonnaise, of course. Over the years my tastes have changed and I have learned to appreciate tomatoes of all shapes, sizes and colors…without the mayo! Sunshine and leaf area help to create the level of sugar in a tomato, which is often why the smaller the fruit the sweeter is is…thus, cherry or plum or grape tomatoes have become the trend. I find they are all good for different uses. 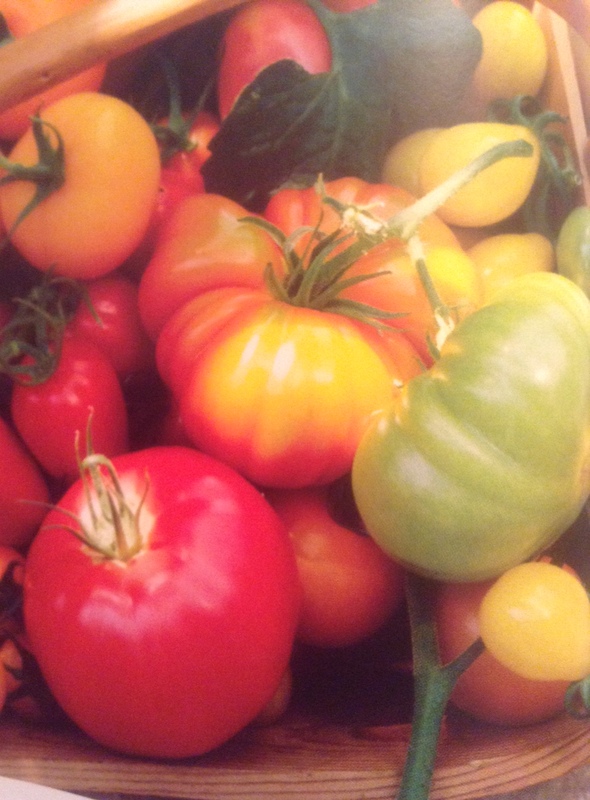 Tomatoes benefit greatly from ripening naturally on the vine so do try to let them reach their own rich color before picking…they should easily twist off the vine. Of course there are some grape tomatoes that are perfect left on their vines for grilling whole. Summer wouldn’t be summer without a huge slice of tomato on a plate dressed with simply salt & pepper and a drizzle of olive oil…OR, the proverbial salad of sliced tomatoes, fresh basil and mozzarella, feta or goat cheese… tomatoes stuffed with crab salad…zucchini, yellow squash, garlic cloves, cherry tomatoes, basil and goat cheese, baked till bursting with flavor…sliced tomatoes and basil and cucumbers…and so much more! Speaking of basil…to me, the refreshing scent of basil is evocative of summer…There are so many varieties of basil available it becomes hard to choose…I keep it simple and grow only 2-3 types. I prefer sweet basil for cooking and sometimes spicy globe when available and African Blue Basil for the garden as it attracts pollinators and butterflies. Basil is quite simple to grow from seed or even easier from starts. Plant it in a sunny spot…with some afternoon shade…in good soil. Keep well-mulched and watered…it’s that easy. OOPS…pinch out any blooms on sweet basil and use for cooking, but, let blooms go on the blue basil to attract beneficial insects to the garden throughout the summer into fall. We are in that time of year usually referred to as the dog days, the lazy days and so on…I always thought it was because during the heat of the day, the dogs slept away the afternoon under the coolness of the porch…until that one day in science class when I found out the real reason. It’s all about the stars and the constellations and where they are in the summer sky…and it was so fascinating to learn about…Of course my science teacher smiled over my answer, but she did tell me later that several of her students had similar thoughts until they actually read their homework assignment! I liked art and English [writing] much more! !